The appeal to pack into glass is well documented. Those seeking products in glass are looking for product that is not tainted by plastic contact. They are looking for purity in the product and most likely align themselves with the goals of environmental awareness and sustainability. If packaging can be recycled, that is a big plus to these consumers. If packaging can be re-purposed or go on serve a purpose well beyond a single use, that is ideal. Almost all Glass Packaging has a Neck with a thread to allow for the placement of a cap. More often than not, the caps are Metal Caps and this tends to eliminate the prospect for sealing using induction sealing as the induction sealing process usually works with a cap holding the induction sealing liner and passing under a high frequency oscillating magnetic field; the metal caps do not allow this field to reach the induction material. a) A Good Barrier on their Opening. b) A form of Tamper Evidence. c) A seal that will not allow for leaking. ii) Tamper evident Labels applied to the lid with one or more fingers that fold down the sides of the container. This method also relies on other properties of the Cap and Capping Equipment to prevent leaking. With new “Break Though Glass Induction Sealing Material” and with a range of standard and Capless Induction Sealing machinery; Adeneli and Benefel can present new and innovative solutions to pack in glass. To date Glass induction sealing material had been limited, in the main, to dry products such as instant coffee or Gel Capsules and other powders. 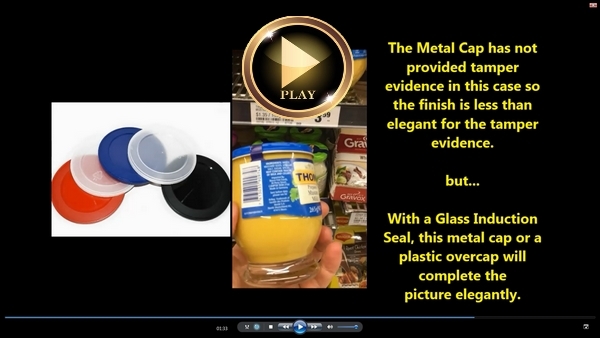 We now have a “Break Though Glass Induction Sealing Material” that works with many liquids including Vegetable based Oils.